Excited by the idea of having a beautiful, engaging, yet simple website? Already ahead of the crowd in what you do, and now you want a website to match? You’d love to be able to work with your web designer, to create the perfect website for you? I could be just the woman you need! I can work with you to create a website which is not just a thing of beauty but also, and crucially, an effective marketing tool. Together we can make sure it is optimised for search engines and easily viewed on all screen sizes, including tablets and smartphones. I’m Jan Scott and since 2004 I’ve been working as a web developer and designer, building simple, airy, elegant and affordable websites for independent professionals. I’ve had very positive feedback from clients and you can read some of that below and by clicking through to the Recommendations page. Based in Hebden Bridge, in Calderdale, West Yorkshire I can build an effective (and gorgeous!) website for you, no matter where you live. 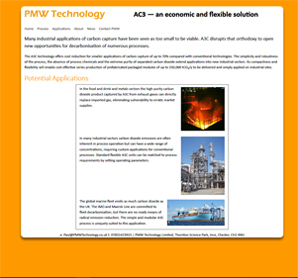 Paul Willson of PMW Technology needed a very simple site, very quickly. Immediately after that went live we started work on the larger site. The whole project from our first conversation to the 2nd site going live took just a month. "It was great working with Jan; she was friendly, flexible and positive, quickly producing a good-looking site which includes all those hidden features that makes it work with search engines and users on diverse devices." 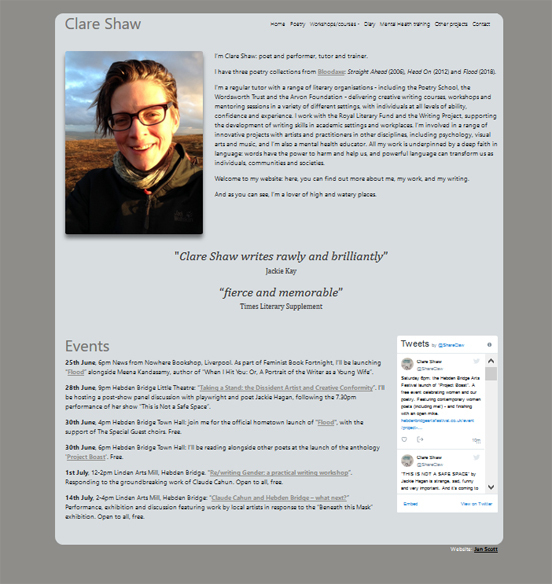 Clare Shaw needed a quick turnaround as her latest poetry collection was about to be published. I created a temporary site with basic contact information and then, just a few weeks later, her permanent site. "Working with Jan was a pleasure. She was prompt, professional and friendly, and she worked patiently with me to create exactly the website I wanted. Wholeheartedly recommended".